Chiao Pao Metal Co., Ltd.
Hard wire has been cold drawn to the required diameter and not subjected to any subsequent treatment process. The steel is usually used without heat treatment or with only tempering to relieve stresses. 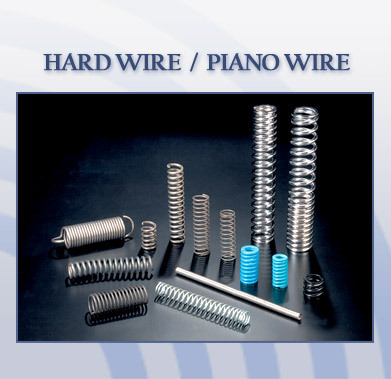 Piano wire, on the other hand, is produced in the form of rods. It has a higher than usual content of sulfur and phosphorus intended. For these purposes, such steel is sometimes alloyed with lead and tellurium. However, due to its high concentration of sulfur and phosphorus, it has lower ductility and toughness than those or regular carbon steel and as well as poor weldability. Applications Spring, spoke, shock absorber, shot peening, umbrella rib, concrete steel nail, shutter spring, bed spring, pin, etc. 859 Soi 11 Moo 4 Sukhumvit Rd. Copyright (C) 2018 Chiao Pao Metal Co., Ltd. All rights reserved.